Dosakaya pappu-Indian lentil dal made with yellow cucumbers, toor dal, onion, tomatoes, and turmeric powder. This healthy dosakaya pappu is one of the most popular and classic recipes South India. A everyday comfort food made in Andhra style. This pappu is tasty, healthy, the protein-rich dish usually served with rice. The best comfort food whenever you feel to have light and still delectable food. Thus, I cannot stop recommending this simple everyday dal. The dal is a delicious component of rich creamy dal, the soft dosakaya, and the rich spices. These elements come together for this ultimate South Indian Comfort dish which is also quick to make. And try this soon and enjoy the taste and nutritious food. Here is a step-by-step recipe shows how to make dosakaya pappu at home. Dosakaya pappu is a native dish of Andra Pradesh, a southern state in India like this mango pappu. It is a good protein source for our daily needs. As we do not include meat on the everyday menu. And lentil is the important source of protein in our diet. We make this a doll differently with this ingredient but with the basic three-ingredient will remain the same and we will be discussing later in the post. I make it often in the kitchen since it is easy to make. This recipe is healthy and not with saturated fat or unwanted ingredients. This recipe is full of healthy ingredients with the right combination. Which balances perfectly with each other on its healthy factor. The dosakaya pappu leftovers-you may freeze or refrigerate. The refrigerated leftovers are good to use for about 4 to 5 days. Frozen leftovers may good to use for a couple of months. Have you checked other authentic and traditional recipes of India made with lentils? Udipi Sambar, vendhaya keerai kootu. Like most of the Indian recipes making this dosakaya pappu differs from family to family. But few ingredients are basic and common throughout India. And they are toor dal, dosakaya, tomatoes, and turmeric. Toor dal is a lentil which is rich in protein and have a creamy texture. A staple ingredient in all the Indian homes. We include this lentil almost every other day in different forms and in different recipes. 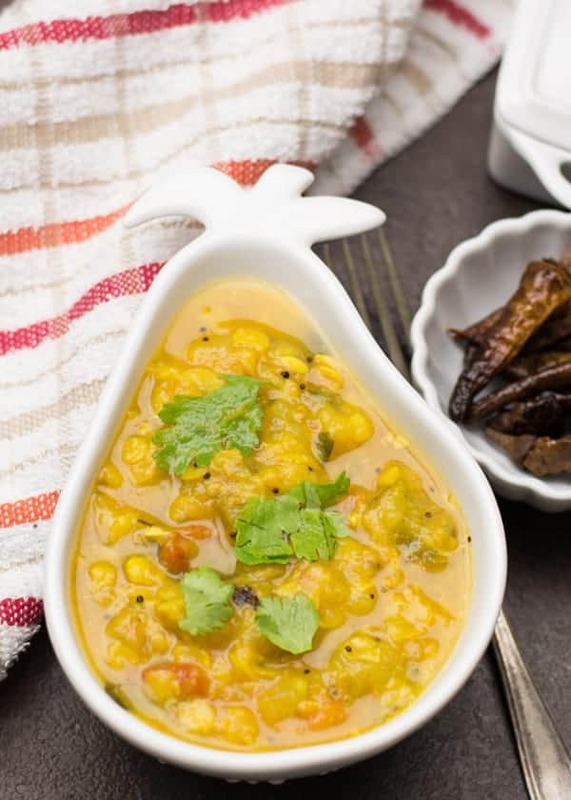 The main recipe makes with this toor dal is Sambar or the dal. Where to get Toor dal? you might be getting this in all the leading grocery stores nowadays. Or you can find it in your nearby Asian or Indian store. If this is not available to you, you may also use the regularly available lentils. Dosakaya is Andhra yellow cucumber. This vegetable belongs to the Cucumber family. But not as flavorful as the regular cucumbers. This does not have its own or strong flavor. It gets adopted to ingredients added to it in a particular recipe. Hence it is a perfect vegetable to go in with any recipe. This dosakaya will becomes soft and pulpy once get cook. And this creamy texture acts as a great additive to this dosakaya pappu. Next important ingredient in turmeric powder. I really cannot think of making any lentil recipe without using turmeric powder. Turmeric powder gives rich and golden color to the dal. Which is pleasing to look and also gives a good mild flavor to the dish. And including turmeric powder in dosakaya pappu is not only for the flavor but also tastes great. And this spice is good and healthy to use. Dal is a creamy side dish made with lentils usually served with rice or roti. It is called in different names in different regions. Tamils usually call it as paruppu. Telugu people call it as pappu. And northern India calls it as dal. 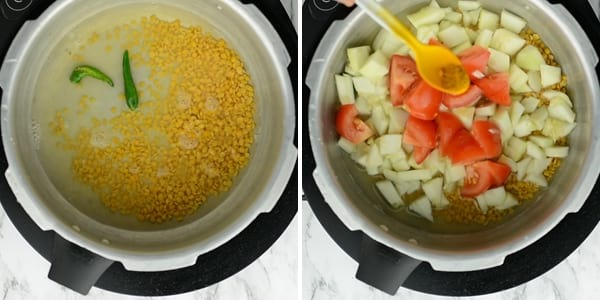 Pressure cooking is the preferred method for making dal. The ingredients required for seasoning are mustard seeds, urad dal, onion, curry leaf and asafoetida. Mustard and urad dal are the basic ingredients. We use these ingredients for seasoning almost every other recipe. A small quantity of onion is more than enough for making recipe. a quarter cup of chopped onion will be perfect. Curry leaves add the flavor which is also rich in iron. Usually, this ingredient will be discarded while eating. Asafoetida, a healthy ingredient added as a flavoring agent. And it is believed to take away all the gastric troubles caused by the dal. I would personally suggest using a pressure cooker for making this dosakaya pappu. As open stovetop cooking method takes huge time to get cook. 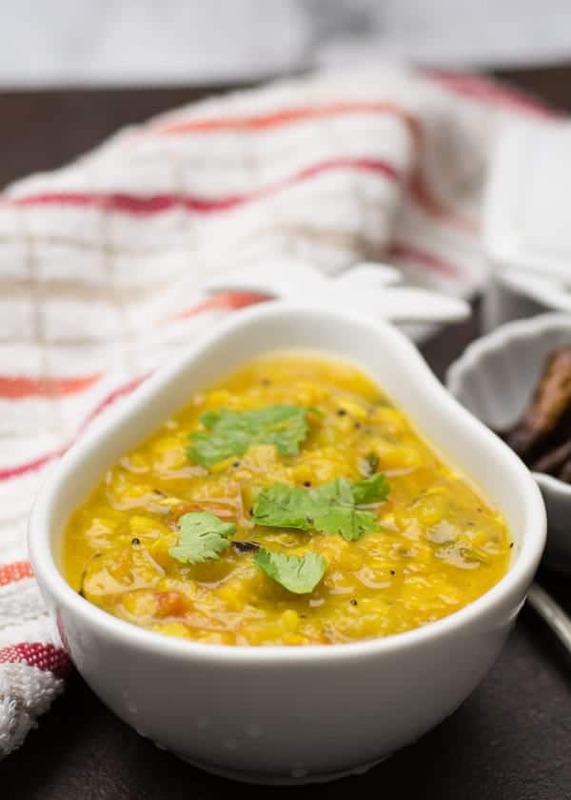 Pressure cooker or the instant pot would be the best method for cooking dal. Pressure cookers are easy to use and easy to clean. And it cuts down the cooking time in half without messing in the kitchen. Wash and rinse the dal before using. It should be the first ingredient added to the pressure cooker. Then add water followed by Dosakaya and remaining ingredients. In medium flame, pressure cooks the dal for 3 whistles. 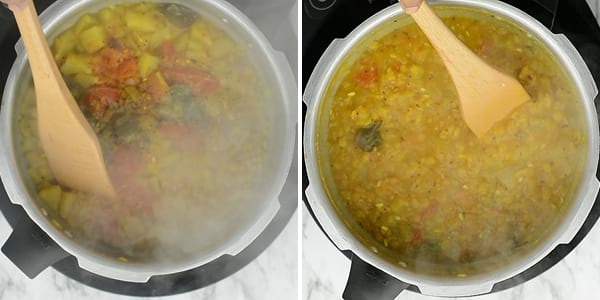 If you are using Instant pot, cook the dal for 12 minutes. You may manually set the timer for 12 in the Instant Pot. Then switch off the flame. Wait for the pressure to release by itself. And this will take about 10 minutes. Then open the cooker user wide spoon to mash the dal. The dal need not to be mashed nicely. And it’s okay if dal is coarse. Now add salt and sprinkle some coriander leaves. These coriander leaves are added as a flavoring agent and as garnishing agent. Now transfer it to the serving bowl and serve it the rice or roti. The salt has to be added at the end of the cooking. You may substitute tomatoes with the raw mangoes. You may also add green chili or red chilies or the combinations of both. 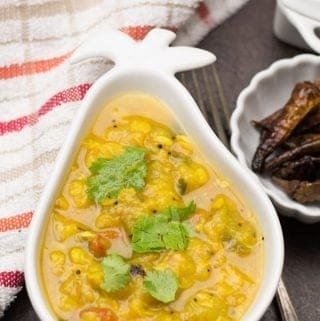 Toor dal can be substituted with moong dal or masoor dal. Add crushed garlic while seasoning. This adds a different flavor. This is a vegan, paleo, and Whole30 food. Dosakaya pappu-Andhra style dal made with yellow cucumbers, toor dal, tomatoes, and turmeric powder. This healthy dosakaya pappu is one of the most popular and traditional recipes South India. In pressure cooker pan, add cooking oil. Add mustard seeds and urad dal. Allow mustard seeds to crackle. 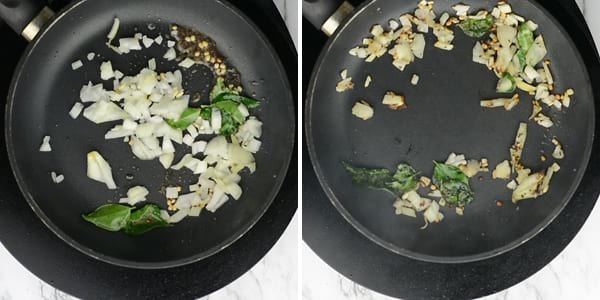 Add chopped onion, and fry until it becomes transulacent. Then add curry leaves and asafoetida. Now add water, toor dal, dosakaya, turmeric powder. In medium flame, cook it for 3 whistles. Wait for 10 minutes and open the lid. Use wide spoon to mash the dal, and bring all the ingredients together. Transfer it to serving bowl and garnish with coriander leaves. Simple and easy. Made it yesterday and turned out really well. thanks.